the vehicle control systems like ME, SRS, ABS, etc. Instead of inserting the pins individually, the pin out can be selected by pressing the UP or DOWN button to the required pin. At the same time, the selected pin out is digitally displayed. Sprinter / LT connector and switch to the required application. - Large LED digital numbers display for viewing which provide less room for error during pin selecting. - K-line (yellow) and Gnd (- black) output jacks for signal measuring. 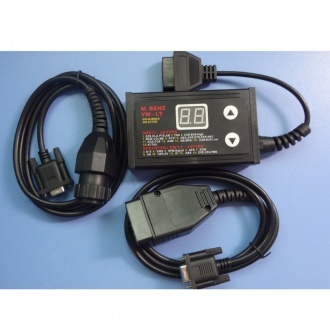 - Comes with female OBDII connector for adaptation to any scantool. - Compact, light weight and easy to operate. This product has no CE certification. Please check with your local country's import regulation.